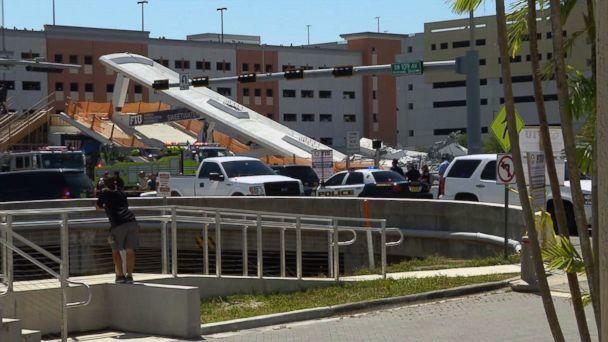 The death toll from the collapse of a brand-new pedestrian bridge near Florida International University has risen to six, including a student at the school, authorities said today. And officials believe the number of dead may rise as investigators sift through the rubble after the search and rescue efforts were called off last night. "There is the sad possibility that under the concrete there may be additional vehicles," Alvaro Zabaleta, a spokesman for the Miami-Dade Police Department, said at a news conference today. "The engineers are working at it in a very tactical way. The structure is fragile and could be dangerous to rescue personnel." -- The cause remains under investigation. -- FIU President Mark Rosenberg said today on "Good Morning America" that the "project has been done as every other project at FIU in terms of construction. ... We only work with certified contractors that have been approved by all the appropriate authorities." -- "We're shocked and we're going to cooperate fully," Rosenberg said. "We've got to get to the bottom of this and we will. "The newly installed bridge, hailed as an engineering marvel, collapsed about 1:30 p.m. Thursday and immediately trapped at least eight vehicles, authorities said. -- One woman who barely avoided the collapse said she saw the structure crumble "in front of me, and it fell on the cars that were waiting for the light to change." -- "I was near the light. I was the first car that moved forward when it changed and I was near the bridge. It was fine, and all of a sudden, I saw it collapse from the left towards the middle," Suzy Bermudez told reporters Thursday. "I ran to see if we could help but the only thing we could see were the car lights in the front, totally smashed, almost to the ground." -- Ten victims were transported to Kendall Medical and labeled as level-one trauma patients, Dr. Mark McKenney, the hospital's program director, said Thursday. They ranged in age from 20 to 50. Eight others were admitted with broken bones and bruises. Additional patients may have been admitted to other facilities. Joining local authorities on the scene are officials from the National Transportation Safety Board and FBI. In addition to ensuring the safety of those digging through the rubble, efforts are slowed because "we don't want to rush it and damage any evidence," Zabaleta said. "That bridge, whatever's left of it, is very, very unstable." 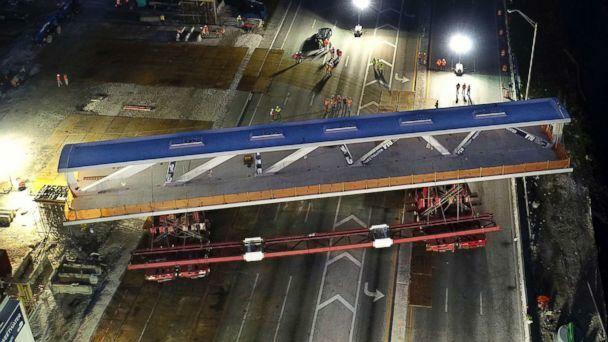 -- FIU had touted the bridge as one of the first of its kind, tweeting that it swung into place Saturday. -- Florida Sen. Marco Rubio, R-Fla., tweeted Thursday that the cables that suspended the bridge "had loosened & the engineering firm ordered that they be tightened. They were being tightened when it collapsed." -- Rubio, who described the incident as "troubling and tragic," said the bridge was constructed for safety after a student died last year crossing that intersection.